This is a slightly revised version of an article that was originally published in Susanne Ravn and Leena Rouhiainen, eds. 2012. Dance Spaces: Practices of Movement. Odense: University Press of Southern Denmark; 137–160. As an ethnographic narrative about artistic research, this article discusses the dramaturgy of the performer and the creation of a performative installation environment from the perspective of the dance member of the collaborating group of artists. The article describes an open artistic process that utilised the collaborating actor’s and dancer’s embodied experiences in constructing the installation environment. More specifically, it introduces how the construction of this environment drew on insights from body psychotherapy and displays how they informed the development of the spatial dramaturgy of the performance. By describing some of the premises, the process and the end result of the artistic project, the article discusses how the embodied practice of the performers pervaded the staging and influenced the manner in which visitors were invited to participate in the installation as a form of shared emplacement. In so doing, it addresses some aspects of dance dramaturgy and new choreographic forms. In this article I address an artistic research project the overall aim of which is to apply insights and practices from a form of body psychotherapy to the artistic undertakings of the dancer engaged with recent forms of European contemporary dance. This is done in order to further understand and facilitate the work of dancers, who are involved in collaborative and improvisatory forms of dance-making that, among other things, rely on their immediate reactions as well as use of voice and speech in performance (cf. Rouhiainen 2012). The more specific focus is on the first artistic phase of the research, in which I, as a contemporary dancer, collaborated with a group of artists in the performing arts and created what we originally termed a ‘participatory performance’. Taking my cue from dance artist and scholar Sarah Rubidge (2009), I have here chosen to call it a ‘performative installation environment’. An emergent understanding of a spatial dramaturgy informed by features of the body psychotherapeutic encounter guided the construction of the performance, in which the audience-visitors were invited to take part in diverse perceptive and physical tasks. In discussing how themes that arose in collaboration with the artists and from body psychotherapy influenced the spatial structure of the performance, this article outlines some of the complex implications this setup had for the performers and participants. In so doing, it contributes to the topical discussion on dance dramaturgy and new modes of choreographic activity from a dance-maker’s and performer’s point of view (deLahunta 2000; Rubidge 2009; Wildschut 2009). Ethnographer Sarah Pink (2009) opines that, as evocative narratives of embodiment, ethnographic places are something ethnographers make while communicating about their research to others. She suggests that ethnographic reports should be understood as emplaced events – permanent texts whose meaning is reinvented and reconfigured according to what is going on around them (Pink 2009, 41–42). A similar notion is increasingly discussed in the realm of artistic research. It is considered to be performative in the sense that it has consequences and produces things in the world. Artistic research explores material, affective and discursive effects which performance acts have on the world (Haseman 2006; Bolt 2008; Rouhiainen 2010; Borgdorff 2011; Arlander 2012). While attempting to evoke insights for its reader, this article interweaves theory, experience, reflection, memory, imagination and discourses. It likewise is an exploration of some of the effects opened by the performance project we engaged in. Before venturing into describing and analysing the process of constructing the installation environment, I will offer a few words on how space can be understood to be an active process of construction involving the body, others and the environment. This I believe will help in understanding the spatial motives of our artistic work and in interlinking this article with the main theme of the anthology Dance Spaces: Practices of Movement (Ravn et Rouhiainen 2012) in which it was originally published. Finnish phenomenologist Jaana Parviainen (2006) argues that the lived body is a place that transcends the body’s material basis and that we inhabit. According to her, it is a topographical terrain in which different kinds of sensations spring forth and that is moulded by habits, learned skills and techniques as well as moral codes. It contains different points, paths and routes the transitions of which we can recognize and follow. Parviainen calls the sensuous experiences the body renders through its actions in a first-person modality kinaesthetic knowledge. She underlines the fact that this kind of knowledge concerns not only one’s own bodily experiences but allows for the epistemic access that individuals have to the world more generally. Bodily knowledge requires functional interaction with the world (Parviainen 2006, 74, 76). In this sense exploring embodied experiences is at least tacitly about figuring out how one is related to one’s situation. This is not an unfamiliar view to body psychotherapists. They likewise rely on the understanding that subjective experiences extend over the body, space and world of a person. As a consequence, instead of simply working on the inner state of patients, body-oriented psychotherapists also focus on their lived spaces; their embodied and implicit way of relating to others and their environment (Fuchs 2007; Totton 2008). Another phenomenological thinker, Edward Casey (Casey 1998), underlines that place is an event – a process in constant change in which the lived body and its environment are interdependent. This view comes close to cultural geographer Doreen Massey’s understanding of place as contingent and active. Massey (2008; 2005) argues that space is the simultaneous existence of more-than-one and is produced through social practices and interactions. She considers space as the simultaneity of stories-so-far and places to be collections of these stories – articulations of the wider power-geometries of space. In this sense, place is an encounter, a moment in networks of social relations, understandings and experiences. It is the coming together of the previously unrelated, a constellation of processes rather than a thing. For her, there is a thrown-togetherness of place. Massey argues that space involves a contingency that can never be completely eliminated; it is the continuous happening of place that we need to bear responsibility for and understand (Massey 2005, 130, 139, 153; Massey 2008; 29, 184, 199). While relating to the notions of Casey and Massey, Pink turns to use the term emplacement. According to her, emplacement relates to the body-mind-environment intertwinement and accounts for the relationships between bodies, minds and the materiality and sensoriality of the environment (Pink 2009, 25). Following her suggestion, I link the kinaesthetic knowledge rendered by the lived body with place as an encounter between the subject, others and the environment, and refer to them together as emplacement. While addressing emplacement, I take heed of Massey’s suggestion that as the dimension of the multiple, of coexisting difference, space brings forth the question of how are we are going to live together. This I do, as I believe that the questions who am I, who are you and how do we relate to each other are basic questions attended to in both psychotherapy and the performing arts(2). Offering possibilities for emplaced encounters in performative installation environments with different visitors is one way of constructing a setting to address these questions. The following paragraphs describe and discuss an artistic process that relates to these themes by especially focusing on how the performers’ bodily explorations instigated a physical environment in which audience-participants could share into this exploration through their own activities. The mentioned questions informed the dramaturgical set up of the installation. My interest in body psychotherapy emerged from personal observations. I was familiar with some of the work done in this form of psychotherapy through my practice of somatically oriented dance. (4) As well as supporting increased bodily awareness and self-understanding, I felt it especially boosted my ability to utilize my immediate reactions as a base for artistic actions in performance, helping me become more engaged with the dance tasks I worked with while dancing. This I learnt in the years 2006–2009 when I explored my bodily experiences in a post-Reichian body psychotherapy-training program that was run by the Finnish Institute for Character Analytic Vegetotherapy (www.luonne.fi). Following Wilhelm Reich’s early formulations, vegetotherapy here means therapy of the vegetative nervous system that is nowadays called the autonomous nervous system and mediates the involuntary aspects of our embodiment. Character, in turn, refers to habitual mental and physical patterns with which persons defend themselves from perceived internal and external threat (Totton 2008, 90). The various post-Reichian forms of body-psychotherapy(5) usually consider awareness of and surrendering to bodily sensations and emotions important. (6) The practice that I was involved in included breathing and physical exercises both to balance bodily tension as well as to increase awareness of bodily sensations and verbal articulation of one’s experiences as well as dialogue with an intuitively, emphatically and occasionally confrontationally functioning psychotherapist (Reich 1990/1949; Välimäki et Saksa 2006; Totton 2008). These were the basic means used to support the client’s development of a more flexible or creative identity. Like in many instances in current dance performance, the focal concern in body psychotherapy was the actuality of the situation and allowing what is emergent in it to take form. What was paramount was perceiving what happens now together with one person or several persons and making decisions on the basis of what one sees, hears and feels (Reich 1990/1949; Mannila 2009). Psychotherapist and theorist Nick Totton (2008) describes body psychotherapy as essentially embodied relating, a process of illuminating and affecting the client’s style of relating to the self, the other and the environment in the present moment. Instead of simply attempting to adjust or realign the body energetically and physically through corrective exercise and treatment, the post-Reichian form of therapy in which I was involved allows the client’s body-mind to guide the therapeutic journey to act rather than be acted on, and to generate images and motifs freely and playfully (Totton 2008, 20, 53, 58). In my experience, this process-oriented approach worked with supporting awareness, tolerance and regulation of one’s experiences and actions for the sustainment of a satisfactory life. I perceived a link between body psychotherapeutic practice and the way in which dancers’ self-awareness and interactional skills are utilized in dance-making and performance. The shift in the past decade in the role and agency of performers within contemporary dance that challenges the traditional competencies and tasks of the dancer has been addressed increasingly. The task of the dancer has moved from being a skilled interpreter of a choreographer’s intentions by dancing to working more collaboratively in planning, making, practicing and performing the creative undertaking (Preston-Dunlop et Sanchez-Colberg 2002; Arlander 2011; Foster 2011; Roche 2011; Rouhiainen 2012). The dancer is positioned as a self-reflective and creative entity in the process of co-constructing and performing dance together with others (Roche 2011, 106). Likewise, she is often well-rehearsed in utilizing her kinaesthetic experiences to guide her movement and interaction with others and the environment. Both dancers and actors work in increasingly egalitarian and collaborative ways as well as rely on immediate forms of interaction with their co-performers, audiences and environments. They explore embodiment, perception and sensation as forms of or basis for “thoughtful action” (Kinnunen et Rouhiainen 2011). In the past few decades, contemporary theatre, dance and performance art have been in the process of pervading each other (Lepecki 2010; Numminen 2011). Dance, for example, often utilizes text, speech and voice in performance; and has adopted dance dramaturgy as one of its sub-disciplines. Theatre, by contrast, has turned to other dramaturgical means than text that often underline embodiment in different ways. (Lehmann 2009; Wildschut 2009; Helavuori 2011) The ensuing cross-disciplinary and new modes of performance in the dance and theatre arts often draw upon a rather general definition of dramaturgy. (7) Dramaturgical practices are concerned with how to deal with the performance material – visual, musical, textual, filmic, philosophical etc. (Van Kerkhoven according to Theodores 1999). The dramaturgical process involves observing, doing, reflecting and conversing to organize, order, structure almost any material in order to weave them into a performance (Theodores 1999; Hotinen 2008). When dramaturgy is thus associated with the composition of a work, it is concerned with the functional logics of the levels, materials and agents of a performance (Turner et Behrndt 2008; Behrndt 2010; Hulkko 2011). According to performance theorist André Lepecki, new performance dramaturgy implies the reconfiguration of one’s whole anatomy, not just the eyes, as it explores possible sensorial manifestos (Lepecki according to deLahunta 2000). 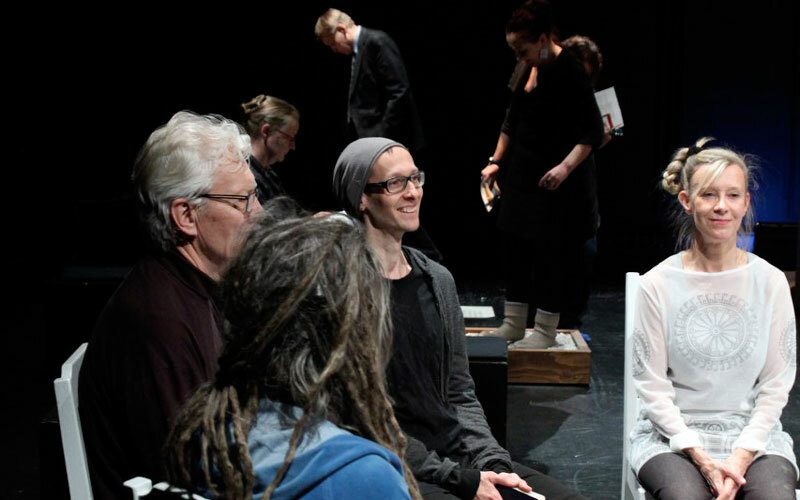 With the rise of post-dramatic forms of theatre, director Katarina Numminen (2011) even claims that in contemporary performance everyone is a dramaturge. She suggests that the responsibility for the dramaturgical logics of the performance lies on all members of the collaborating artistic group (Numminen 2011, 35). In line with this approach, director-researcher Pauliina Hulkko (2011) argues that there is a new self-regulatory requirement for performers in such contemporary dance and theatre that utilizes multiple and cross-disciplinary approaches in constructing performances. Instead of following conventional rules, the performer needs to assume what Hulkko terms ‘the gesture of self-regulation’ in each production. The performer needs to establish relationships between the performance materials and reveal how she manages them to produce holistically embodied and sensuously evocative performing. Expanding on theatre director and pedagogue Eugenio Barba’s conceptualization, Hulkko calls this approach to acting and performing the actor’s or performer’s dramaturgy (Barba 2010, 23; Hulkko 2011, 17, 24)(8). In my view body psychotherapy offers an approach that can support the self-regulatory gesture of the performer. Relying on an empathic attitude(9), together with Helka-Maria, we considered this gesture by investigating breath work and physical awareness exploration as well as written, drawn and spoken articulation of our experiences with each other. We likewise discussed the varying roles of, for example, the researcher, producer, facilitator, practitioner, performer, observer, listener and commentator that we felt we occupied at different points of the process. We also kept negotiating and re-formulating the tasks, the setting and the parameters of our collaboration as it proceeded and brought in new experiences, questions and elements. Usually we began each rehearsal by discussing where we were at and what we would like to work on that day. We used our drawings, personal notes and the occasional interviews(10) we gave each other as forms of post-rehearsal reflection. However, we did not delve deeply into observing and interpreting issues of transference that belong to character analytic body psychotherapy, which has strong roots in psychoanalysis. Transferences colour any dialogical process, in the sense of scripts of internalized relationships that are projected into and replicated in new relationships (Ormont 1984; Soth 2005). I believed tackling them belonged to a truer therapeutic process in which the roles between therapist and patient are clear and ample time is given to working through transference issues. Our open creative collaboration had a production schedule and strived for an artistic end product and therefore did not entail a setting stable, containing and sustainable enough for such work. Instead, we utilized our experience and understanding of the way we related to each other to understand what kinds of materials we wanted to be working with, how we could do so and to support each other in addressing them as well as determining the tasks each one of us worked with in the process. From the beginning it was clear to us that we were interested in our embodied experiences and how they could inform the construction of the performance. In exploring breathing and diverse physical routines drawn from body psychotherapy together with Helka-Maria, we paid attention to our observational and emotional attitudes and how they affected our postures, movement, and use of voice. We used these insights to recite texts we wrote and edited about the history of our bodies. We created short scenes of exaggerated physical characters that exemplified typical attitudes we found that we often embody in our everyday lives. Through this kind of pre-performance exploration we were creating the groundwork of our performer’s dramaturgy that became translated into a dramaturgy of the whole performance. Instead of imposing pre-determined forms of performed embodiment and a chronologically evolving dramaturgy, we wanted to offer the visitors an arena for finding their own way around. We aimed at creating a sufficiently comfortable and safe environment in which they could choose the degree of participation they found enticing and suitable for themselves and in this sense explore the emplacement the performance evoked. We thus had an agenda of offering the visitors a chance to scrutinize how they are emplaced and inhabit the performance through paying attention to their embodied reactions and actions – as potentials ways of living and relating to others, the environment and potentially the world (Bourriaud 2002). Here we followed the ideology of contemporary performance in that it is said to present and engender alternative modes of living and unconventional patterns of action (Helavuori 2011). We began thinking about the performance both in terms of exploratory tasks offered to the visitors as well as our own improvisatory performance scores. One impetus for this was that in the psychotherapeutic process, it is not the therapist but the client who produces the material analysed and interpreted, and in that way guides the process. The therapist is there to follow and support the client’s process – to work out what is trying to happen and let it happen (Totton 2008). Consequently, we felt that the audience members should be given, at least to some extent, the chance to manage and influence the performance as well as generate performed material. In order to achieve this, we drew imaginatively on principles involved in the body psychotherapeutic encounter in constructing the soundscape, lighting design, video-projections, staging and task instructions for the audience. These principles related to empathic encountering, containing interaction, contact, the use of breath and voice as well as body awareness work. They intuitively informed the construction of the performance environment in which the visitors could explore how they are emplaced, who they are and how they ask the question who they are (Kinnunen et Rouhiainen 2011). In one of our conversations, sound designer Antti Nykyri began thinking of the performance in terms of a spatial dramaturgy. After all, we were constructing a performance environment with a rather high level of interactivity, where the visitor was expected to construct at least a fragmentary narrative timeline, make choices, adopt diverse social positions, and engage directly in action (cf. Turner et Behrndt 2008). From that point onwards we thought about our performance in terms of a spatial composition, an architectural structure to be journeyed through and to provoke a shared event. The rhythm of sound, degrees and direction of light, movement, architectural structure and the audience’s bodily journey acted as dramaturgical material (cf. Turner et Behrndt 2008). The tasks were located and defined by constructed spatial areas within the black box theatre where the performance was staged. The audience actually became immersed in the performance space by sitting, standing, moving from one location to another and by actively engaging in diverse exercises. The tasks we offered to the visitors included simple physical actions such as slow walking and deep breathing. The first is considered a grounding exercise by some body psychotherapists. It refers to engendering a relaxed and active connection between the weight of the body and the ground that supports it and that also fosters postural aliveness as well as a sense of where one stands as a person (Conger 1993; Totton 2008). Paying attention to breathing was understood as helping to anchor the visitors’ awareness in the present moment and their bodies. In body psychotherapy, this is considered a pathway for better connection with or awareness of bodily sensations and emotions. (e.g. Totton et Edmondson 2009; Martin et al. 2010). Slow walking and breathing exercises were something we ourselves repeated at the beginning of each of our rehearsals. The tasks offered to the visitors also included an adaptation of Twister, a physical skill game played on a mat designed for it (cf. en.wikipedia.org/wiki/Twister_(game)). 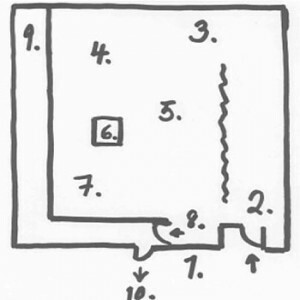 The visitors could randomly pick from a box of instruction notes requesting them to do specific physical acts in a specific location. We likewise set up a circle of chairs in which visitors were asked to face each other in pairs and answer the question: “Who are you?” with one word ten times in a row. 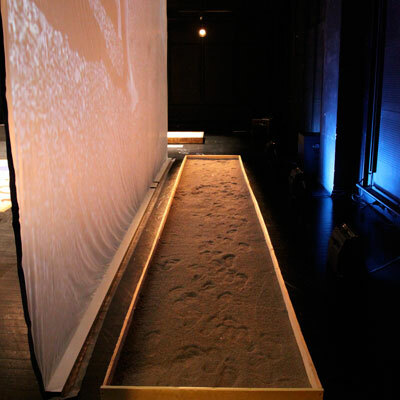 The space also included a large video screen with video-material on feet probing the sand and water on a beach shoreline, a small video-projection of the legs of people walking up and down a staircase, chalk with which to draw on the floor and walls. The soundscape was constructed of sampled sounds of breathing, voices talking, and bells. The lighting design highlighted activity areas and changed slightly according to the way the visitors and performers positioned themselves in the space. Who are you – breath, steps, words and other things? The participatory performance invites you into actions that identify bodily experiences. What kind of breathing feels most familiar to you today? Can you walk slower? What do you hear right now? (Who speaks?) Whom do you watch and what do you see? A video asks questions. As an introduction to the performance, we placed a video in the entrance hall waiting area that showed the front landscape view of a walking person seen from knee level with the edited text: Who is walking? Where? Why? Gravel path: slow down. A six-meter long gravel path for slow walking. Sounding boxes: touch and try out. The “Sonic Sandboxes” are the creation of Antti Nykyri. (11) The two large boxes covered with small stones and underlying contact microphones formed instruments that could be played by touching or placing weight on them. Chair circle task. Visitors were asked to sit opposite each other in pairs. Then one of the pair askes “Who are you?” and the other answers with one word. This task was repeated ten times. Position game area: An application of Twister that prompted the visitors to take diverse positions or do simple movements and pay attention to their sensations and perception. Drawing wall: A wall on which visitors were invited to write and draw their observations and thoughts. 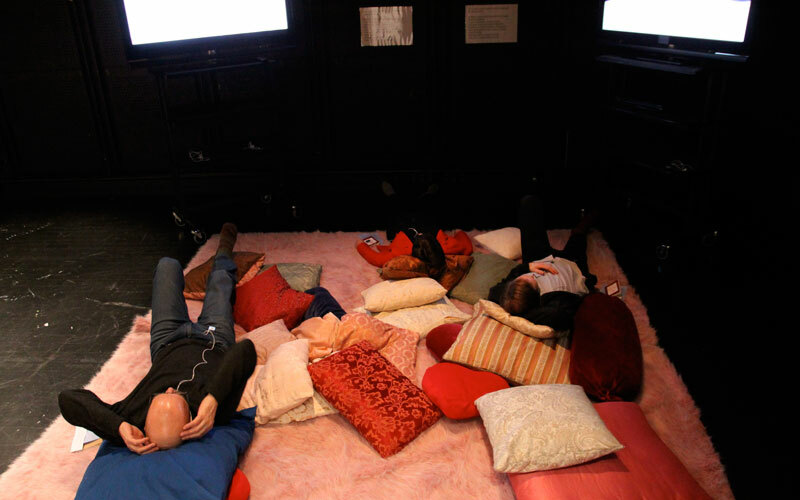 Breathing corner: An area with two screens featuring video-material of body parts moving in the rhythm of breathing and a rug and pillows to recline on. The area also had six iPods for the visitors to use. They contained taped instructions to listen to the breathing on the tape and to slow down one’s own breathing. The path of light and darkness: listen and roam: An in part brightly and in part dimply light hall contained a soundscape with a mixture of bells and humming sounds sung by Helka-Maria and I as well as the video-projection of a staircase. Turning point: At the end of the hallway there was a full-body mirror and a large bowl with chocolates. The chocolates had notes attached stating that: “You are a riddle”, “You are soft breath”, “You are a visionary”, “You are soft breath” etc. Return to the hall: Here the performance ended. The space had posters taped on the floor or on the walls that gave detailed instructions on what the audience was asked to do in the different areas. In the midst of greeting the visitors and sometimes guiding or participating in their explorations in the space, Helka-Maria and I improvised with the short scenes we had been working on. 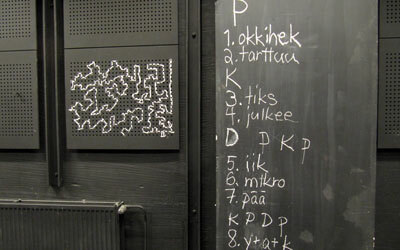 We gave non-sensical names to our materials and wrote them on them on one the walls. We silently agreed on moments when to turn to performing them, as we had done so, we crossed over the related chalk writing on the wall. This kind of participation in which one can reflect and experience things without a compulsory plot or sitting in an auditorium is wonderful. There were only a few other people present, which made the space more intimate and gave permission to explore, lay around and linger – if there had been a lot of other participants, I would not have dared. I was quite tired and chilly when I entered the space. The space received me with its peace, warmth and freedom. I felt that I was not obliged to do anything, so I first went on the rug to rest. I remember thinking that “this is exactly what I need” and “if one could always take a rest position in performances”. Sensing is so recuperative, it was fun that there were different kinds of stimuli, sounds, feelings. . . I felt as if I was at the core of some kind of humanity or life: words were not important. . . There was nothing to understand, I only needed to feel and experience what happens in the space, in me and the others. Without words in the midst of a childish act, an occasion with nearly a stranger made me feel like a child, who does not have to rationalise the importance of the situation. This was important for me for totally irrational reasons. I immediately liked this person and only because I experienced her/him to “understand” how wonderful and unique the situation was. The greatest joy was to do the “who are you” game with a total stranger, how much happened, how I played a dramaturge became more intense through the repetition, meanings were created from delicate nuances. It was pure joy and I thank you for the change to encounter another person! The breathing corner had a special impact on me: Here we breathe together and everything is all right. Almost a very early, perhaps prenatal experience. From Spatial Dramaturgy to a Performative Installation Environment. What was our performance structure finally like? Most theatre and dance performance is centred round the exchange and community that is built between the audience and performers in live events. In this sense they always rely upon participation by performers and audience members alike. Performance, dance and theatre art therefore involve different forms of relational encounters (Bourriaud 2002; Fischer-Lichte 2008 38, 40). We used the term ‘participatory’ to indicate that the performance we constructed involved the audience members in physical action, verbal interchange and contact with each other or the performers outside a proscenium stage setting. However, on post-performance reflection, the term participatory did not quite seem adequate in describing our project and I searched for a new concept to describe it. Owing to the cross-artistic and spatial set up, in our conversations with the artistic group the term installation was mentioned. Generally, in the realm of visual art, installation art relates to an artistic genre of three-dimensional works that are set in an interior space and designed to change the perception of that space. This resonated with our work and as I familiarized myself further with the topic, it became very evident that since the late 1950s, aside from dance, the term choreography has been applicable to painting, sculpture and installation art. Exhibitions in visual art have invited visitors to perform certain movements, effectively creating choreographic performances within works of art (Rosenthal 2010). Considering Who are you – breath, steps, words and more? as a performative installation environment, underscores its immersive spatial design and audience activating tasks both of which were meant to allow the visitors to make new observations about themselves – their embodied way of relating to themselves, the other visitors and the performance materials. It likewise offers the possibility of understanding the visitors as performers. Their actions and the way they invited each other and Helka-Maria and me to participate in the tasks they explored produced something that could be described as sensorial, concentrated and lingering embodied interactivity or co-emplacement. A spatial set up of audience-activating areas that ushered visitors into an embodied journey became the logic of our performance. Our performer’s dramaturgy became extended from the personal body work exploration and feedback between Helka-Maria and me to us sharing experiences and goals together with the collaborating group and on this basis to working with a spatial dramaturgy. The latter design spread our embodied practice into an environment in which the visitors could similarly explore their embodiment and emplacement. This was the manner in which we developed our staging strategies to explore “the function, condition and course of the encounter and interaction between performers and audience members” as an experiment on how to work with themes drawn from body psychotherapy (Fischer-Lichte 2008, 40). This established a performance in which role reversals between performers and visitors, the modes of contact between them as well as the issues concerning the individual and the communal or the private and public were addressed. The previously presented feedback material alludes to both personal and shared experiences between the audience members. The recoding of the audience discussion after the second performance contains comments on how the audience members felt they themselves became performers in the installation, especially when exploring the position game area. Dance scholar Susan Foster (Foster 2010, 32) and art curator Stephanie Rosenthal (Rosenthal 2010, 4) point out that in contemporary dance, choreography is increasingly understood as a somewhat open frame or set of principles that structure movement – suggestions for possible courses of action to be taken by performers and the audience members or both of them together. These frames provoke the exposure of both personal and social kinaesthetic values and practices to their participants. Ever more often constructed performative installations are a case to the point. However, there is still lack of discussion on how they come into being and what concrete implications they have on the performing artists and audience participants. I have tried to answer to this gap, with describing how personal and shared bodily exploration can foster a shared space, a place of encounters. This article was written with the support of the Academy of Finland that funded my Academy Research Fellow position. Batson, Glenna. 2009. “Somatic Studies and Dance.” Accessed August 15, 2011. www.iadms.org/associations/2991/files/info/somatic_studies.pdf. Behrndt, Synne K. 2010. “Drama, Dramaturgy and Dramaturgical Thinking.” Contemporary Theatre Review 20 (2 ): 185–196. Bolt, Barbara. 2008. “A Performative Paragidm for the Creative Arts?” Working Papers in Art and Design 5. Accessed October 20, 2009. sitem.herts.ac.uk/artdes_research/wpades/vol6/bbfull.html. deLahunta, Scott. 2000. “Dance Dramaturgy: Speculations and Reflections.” Dance Theatre Journal 16 (1 ): 20–26. Fischer-Lichte, Erika. 2008. The Transformative Power of Performance: A New Aesthetics. Translated by Saskya Iris Jain. London and New York: Routledge. Fuchs, Thomas. 2007. “Psychotherapy of the Lived Space: A Phenomenological and Ecological Concept.” American Journal of Psychotherapy 61 (4 ): 423–439. Ormont, Louis R. 1984. “The Leader’s Role in Dealing with Aggression in Groups.” International Journal of Group Psychotherapy 34 (4 ): 553–572. Roche, Jenny. 2011. “Embodying Multiplicity: The Independent Contemporary Dancer’s Moving Identity.” Research in Dance Education 12(2 ): 105–118. Rosenthal, Stephanie. 2010. “Choreographing You: Choreographies in the Visual Arts.” In Move Choreographing You: Art and Dance Since the 1960s, edited by Stephanie Rosenthal, 7–19. London Southbank Centre: Hayward Publishing. Young, Courtenay. 2010. “The History and Development of Body-Psychotherapy: European Diversity.” Body, Movement and Dance in Psychotherapy, 5 (1 ): 5–19.